Read the review, but the tech is solid. 32′ cable will cost $300 and 100′ about $650. That should cover most needs. Review: Corning’s Thunderbolt Optical Cable. Not sure about this, but might be worth a look. 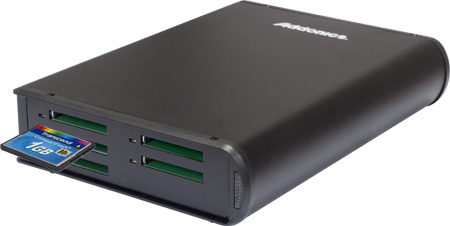 Addonics Product: Sapphire 5-Slot CF Drive. The cheapest 128GB CF card I could find is the Komputer Bay card, although I am not sure I would trust this. That would make a 640GB Raid 0 for about $853. I think for that kind of money, I would rather have the Promise J2. Just ordered one on these. Watch for a hands-on report this week! The Final Cut Pro 10.1 cheat sheet – fcp.co.